Best Air Rifle Under 200 – My Top 7 Picks! Air rifles come at a premium with some costing upwards of $1000. But is spending $1000 on an air rifle a wise decision? Well, it really depends on your preference as well as budget. If you are like me $500 or more is quite steep for an air rifle. Fortunately, there is a great selection of air rifles that cost $200 and below. Of course in this price range, you have to be ready to make some compromises. But with some digging, you can get your hands on a jewel of an air rifle. Getting the best air rifle under 200 can be a difficult but not impossible task. There are quite a number of rifles in this price range. In fact, virtually every manufacturer has an air rifle that costs less than $200. Of the many options available only a few made it to my list of the best air rifle under 200 dollars. Seven to be exact. These are the rifles that I believe offer the best value for your money. Also, these rifles manage to offer accuracy and beautiful aesthetics at an affordable price. Now before we get to the reviews it is important to note that air rifles come in different categories. The most popular being C02 powered, spring powered and Pre-charged pneumatic or PCP rifles. PCP rifles are quite expensive compared to C02 and spring powered. So expect to find a lot of spring powered and C02 powered rifles on my list. If you want a PCP air rifle you may have to fork out some extra cash. The good folks at Gamo gave us one of the most beloved air rifles, the Gamo Whisper Fusion Mach 1. This inert gas powered air rifle comes in two variations a .22 caliber and a .177 caliber. For the purposes of this review, I will be focusing on the .177 caliber. One of the first things I noticed about this air rifle is that it is not your average air rifle. For starters, it has a real shock wave absorber recoil pad installed. Most air rifles come fitted with a molded rubber pad masquerading as a recoil pad. But what really separates it from the rest is its use of a special inert gas cylinder. This 33-millimeter pneumatic cylinder is capable of propelling a .177 pellet at 1420 FPS. This is quite impressive given that as I said most rifles in this price range as spring powered. Without a doubt, this is one of the most powerful air rifles priced at below $200. Which means it makes quite the bang when it’s fired. Or does it. Ordinarily, this kind of rifle would produce the same kind of sound produced by a .22 rimfire rifle. But this is not an ordinary air rifle as it is fitted with Gamo’s tested and proven whisper fusion technology. This noise dampening technology does a great job of minimizing the sound produced by the rifle when fired. From afar the Crosman DSBR C02 powered full auto BB air rifle looks a lot like the legendary HK416 tactical rifle. So you can bet I was thrilled to get my hands on this beautiful air rifle. And while it is not as sophisticated as other pricier models it is well worth it. Its short barrel design is probably aimed at mimicking short barreled tactical rifles. Whichever the case, the short barrel makes it easy to handle. Overall the rifle measures 26.9 and 30.4 inches long. And in true tactical shooter fashion, it comes fitted with a 25 round drop-out magazine. This magazine houses the rifle’s BB pellets. Squeezing this rifle’s trigger will give you an output of 1400 rounds per minute, not bad for a budget air rifle. Speaking of the trigger it is rather short and light. However, it is not so light as to cause a misfire, which is great. You can choose to fire it either in full auto or semi-auto mode. The full auto mode does rock the gun a bit but it is not something you cannot handle. This air rifle is as close you are going to get to a real tactical rifle at a limited budget. It’s so realistic that you can actually take it apart as you would a tactical rifle. Also, the blowback action of this C02 powered rifle does produce some recoil, which is to be expected. As with most Gamo air rifles, the Gamo Silent Cat air rifle packs quite a punch. More importantly, its bang is not as loud as you would expect from such a powerful rifle. There is a noise dampener installed in the barrel that is responsible for its silent operation. With this rifle, you can use either .177 PBA pellets or .177 lead pellets. When using the more conventional .177 PBA pellet you get a muzzle velocity of 1200 FPS. This speed drops to around 1000FPS when you switch to the .177 lead pellets. A manual trigger and automatic cocking safety system helps reduce the effects of the recoil. So does the ventilated rubber pad. Obviously, this is not as efficient as the recoil dampener pad found on its sibling the Whisper Fusion but it still gets the job done. It is a spring powered rifle and utilizes a break barrel. This means it has almost zero upkeep and is always in good condition. Also, it is easy to handle for both beginners and experienced shooters, which is another plus. Overall it weighs 7 pounds and measures 48.8 inches long. It is not the lightest but you will not have any trouble carrying it around. There is no point in buying a loud air rifle irrespective of its price tag. This is something that Ruger understood perfectly when making the Targis Hunter max .22. This is one of the most silent air rifles I have ever used. Installed inside this .22 caliber air rifle is a SilencAIR 5-chamber noise dampener, which I have to say performed as advertised. Especially considering the power of this spring piston rifle. It is capable of propelling alloy pellets at speeds of up to 1000FPs. Lead pellets, on the other hand, get ejected out of the barrel at speeds of 800FPs. It is the perfect rifle for taking down mice, squirrels, rats, rabbits, and other pesky varmints. And you are unlikely to miss your target. In addition to fiber optics sight at the rear, this air rifle also comes with a 3-9X 32 rifle scope attached. If you want to swap this stock scope for another, you can, thanks to the Picatinny rail installed on the rifle. The ambidextrous stock is all weather and can survive harsh weather conditions. Thus, it can be used for target practice as well as for outdoor hunting of small rodents. Similar to most air rifles in the under $200 price range it has a rubber recoil pad. With its set of features, it is arguably the best 22 air rifle for hunting under 200 on this list. It is both super quiet and powerful, which are the two things needed for a hunt. SIG is a well-known name in the firearms industry. This is the company behind some of our most beloved hunting as well as tactical rifles. So we already know SIG can make exceptional rifles but how good is the company at making air rifles. Well, a look at the MPX C02 powered air rifle reveals that the company’s line of air rifles is as exceptional as their line of tactical rifles. Modeled after the SIG Sauer rifle, this C02 powered rifle looks really good. With this air gun, you get a 30 round magazine that holds the gun’s .177 caliber lead pellets. It has a muzzle velocity of 575 FPS. Now, this velocity might not be as impressive as that of others on the list, but you will still be able to hit your paper targets. At the back is a synthetic stock that I found to be very well made. And on top of the barrel is a Picatinny rail, for use when you want to install an optic. Similar to its real sibling this rifle has a short barrel as it measures 23.75 inches long. In regards to the optics, you get to choose between a red dot and a folding sight. Both of which fit onto the gun’s optics rail. One of the best nitro piston air rifle under 200 for squirrel season is the Hornet Maxxim air rifle. Available in either a .22 caliber or .177 caliber configuration it is the perfect weapon for small game hunting. At its price point, it has a lot to offer. 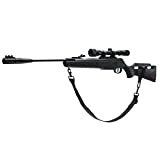 First, it being a Gamo production it features the effective whisper maxim noise dampening technology. The inert gas technology allows you to fire .177 pellets at a muzzle velocity of 1300 FPS. To add on to this, it uses Gamo’s patented Custom Action Trigger. This is a two-stage adjustable trigger that gives you a lot of flexibility when firing. Also included is the company’s shock wave absorber that helps reduce the impact of recoil. Especially given that it comes with a 3-9x40 rifle scope installed. This scope is protected against recoil with the recoil reducing rail. This recoil rail is designed to minimize recoil impact on high powered rifles. One of the most realistic looking air rifles on the planet has to be the Black Ops Sniper Rifle air gun. Complete with a bipod, a rifle scope, and a suppressor, shooting this high powered rifle is as exciting as it can be. With the 4x32 rifle scope attached it is incredibly accurate for an air rifle. This coupled with its bipod means you are getting a complete package. It fires .177 caliber pellets at speeds of up to 1250 FPS, thus it is efficient at eliminating small animals. While it does come with a scope installed you can swap out this scope with your preferred one. This is thanks to the 6-inch tactical rail installed on the rifle. This rail makes it easy to install almost any type of scope. The manufacturer of this rifle went with a more modern power piston technology instead of the more traditional spring-powered technology. The power pistons work much better than spring powered rifles. When searching for the best 22 air rifle under 200, there are a number of things to consider. Here are some of the factors to consider when shopping for an air rifle priced under $200. Now that you have gone through my list of the best air rifle under 200 dollars, the next step will to buy one. One question though, how do you intend on using your air rifle, for target practice or hunting/pest control. Not all air rifles are built for hunting or pest control. Some just aren’t powerful enough to penetrate anything other than plastic and paper targets. If you want a rifle for hunting or pest control look for one with a high muzzle velocity. For .177 caliber air rifles, a muzzle velocity of 830 FPS and above will be sufficient to take down a small animal. For a .22 caliber rifle, a muzzle velocity of 620 FPS and over will be ideal. If you are more interested in target practice a muzzle velocity of less than 600 FPS will do. Sometimes abbreviated as LOP, length of pull is the measurement from the trigger to the end of the stock. For adult shooters, a length of pull of 14 inches will be suitable. However, for younger shooters and newbies an LOP of between 10 and 12 inches is recommended. As with any other weapon the weight of an air rifle will have some effect on its performance. If a rifle is too heavy it will be difficult to handle. Therefore, it is wise to look for lightweight rifles that are easy to carry. 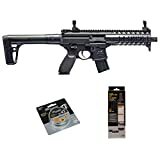 Even though you should not expect much in regards to additional features from budget air rifles, there are those that come with some useful add-ons. Some feature a rifle scope installed while others feature a real recoil absorber. Whatever the add-ons are it is beneficial to have a rifle that has something extra to offer. And if you are able to get one for less than $200 the better. For $200 or less you can get yourself a pretty decent air rifle. However for the same amount you can end up with a stinker of an air rifle. It all depends on how well you know air rifles. The best air rifle under 200 will obviously have features superior to others. And with the above guide and list finding a suitable budget air rifle will not be a problem.